ermites are actually nasty little creatures that offer very little benefit and cause a whole lot of damage instead. But they are fascinating. There are a lot of interesting things about termites that you might not know. They have that in common with Miley Cyrus. But instead of partying it up, they’re actually working hard – 24/7, in fact. Termites are always looking for wood to chew, building mud tunnels, and doing the work of the colony. They never sleep. Imagine what you could do with the same ability? Unfortunately, one of the things that makes termites so interesting also makes them terrifying. If they are in your house, they will never stop eating through the wood in your walls, your floors, and your ceilings. If left unchecked, they will just keep eating until there is nothing left to eat. The largest termite nest ever found had more than 3 million termites. Three million! Termite nests can pile as high as a person. They have to in order to hold that many bugs. Fortunately, you are unlikely to have that many termites nesting in your home at once. But even a fraction of that amount can cause serious damage. That’s why it’s so important to get a Scottsdale termite pest control in place to protect your property. How long do you think the housefly lives? A day or two? (It’s actually 28 days.) You may mistakenly believe that most bugs don’t have a very long life span, so even if termites are a nuisance, they are short-lived. Not so. Termites can live anywhere from 15 to 25 years. If you don’t hire a professional termite exterminator to get rid of them, they will be a nuisance for a long, long time. Termites don’t just live a long time, but they also furiously reproduce. They don’t sleep, remember? They have to fill that time somehow. When they aren’t eating and working, they are reproducing. A queen termite can lay up to 40,000 eggs per day. Imagine how quickly a termite problem can spiral out of control if left untreated! If you suspect termites in your home, you must call a termite company right away to identify the problem and create the right treatment plan for eradication. Eating a termite may seem disgusting to you, but they actually provide a lot of nutrition. In fact, they have more protein than beef. Eating termites can do a body good! People in other countries, like Zaire, actually eat termites as a regular part of their diet. Some people also turn termites into cooking oil. It makes for a healthy cooking oil that is also high in protein. Win-win if you don’t think about the source! No, they don’t eat blood, but they do seek out wood like they are sucking the life out of your house. They also hide from the sun. That’s one of the reasons why they build the mud tubes for traveling and why they like to chomp on wood inside your house (or a tree) instead of just grazing on branches or other organic matter laying on the ground. See them for the life-sucking scourge that they are and work with a termite exterminator to eradicate them. Termites may be interesting, but they are still pests. 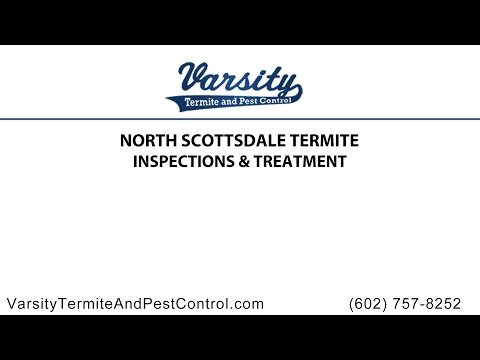 Call Varsity Termite and Pest Control to schedule an inspection in Scottsdale and find out if these nasty little critters are destroying your home. A termite exterminator from our team will develop a termite control plan that will not only eliminate any termites that are currently residing in your home, but will also reduce the risk of future infestations. We are a top-rated Arizona termite company thanks to our exceptional service and reliable results. Call us today to learn more about how we can help you with termite pest control.